I had a notion to make quiche after drooling over Janice's quiche. Well, actually it is a Flemish Leek Tart. Much fancier, but it still made me crave quiche. I usually buy shortcrust pastry. I feel no shame in that. It is pretty good quality and as a working mum, I don't always have time to make my own. Today is one of those days when I had the time, so homemade it is. The pastry was flaky and the mushrooms and spinach go so well together. Add in the salty feta cheese and you have a pretty fabulous quiche. 1. Preheat oven to 200c/180c fan/400f/gas 6.2. Roll out your pastry to slightly larger than your pie dish.3. Place over the dish and gently ease into the corners, leave an overhang over the edges. The pastry came shrink a little, so it is better to leave the excess on and trim later.4. Cover the pastry with greasproof paper and baking beans and bake the pastry for about 20 mins.5. Remove from oven and careful lift out the beans using the greaseproof paper. Set these aside to cool, before returning them to their tub.6. Prick the base of the pastry with a fork and return to the oven for 10 minutes until lightly golden.7. While the pastry is baking, sauté the mushrooms and garlic until soft and the liquid is cooked off. Season with black pepper and set aside.8. Place your spinach in a colander in the sink and pour over a kettleful of boiling water. This will wilt the spinach. Refresh the spinach with cold water, then squeeze as much of the water out as possible, then pat dry in a clean teatowel. Chop and set aside.9. Remove your pastry case from the over and spread over the mushrooms and spinach. Next crumble over the feta cheese and grate some fresh nutmeg over your ingredients.10. Lower the oven to 180c/160c fan/350f/gas 4.11. In a jug, whisk the eggs and cream. Season with salt and pepper. Pop the pastry case back in the oven and holding it level, pour over the custard filling.12. Bake for about 40 minutes until golden and firm in the centre. An easy shortcrust pastry. All the ingredients should be cold and make sure you don't put too much water in or the pastry will be tough. Add a little water at a time until the dough comes together. 1. Sieve the flour into a bowl before transferring into a food processor along with the salt. Add the cubes of cold butter.2. Whizz gently for a couple of minutes until the mixture gets crumbly.3. Pour into a bowl and rub with your fingers briefly to make sure it is the right texture.4. Drizzle over 1 tsp of really cold water, cutting through with a knife to combine. Start adding the second spoonful gradually, until there is just enough enough water in the mixture to bring it together.5. Bring it together with your hands. Shape into a ball and wrap in clingfilm. Pop it into the fridge until you are ready to use it. It should be in the fridge for at least half an hour. I've got all the ingredients to make this! Feta in quiche is a thing of beauty - I can't resist it! so good... is it officially quiche season?... oh fabulous... love your combo of ingredients, very posh! I do love quiche! But have never made one with spinach and feta. Looks great, Jacqueline. I adore quiche and this combination of flavors sounds wonderful - YUM! I haven't made a crustless quiche before Karen, is it more of a spanish tortilla? This looks delish - some of my favourite flavours combined with pastry and eggs - will have to try it soon! 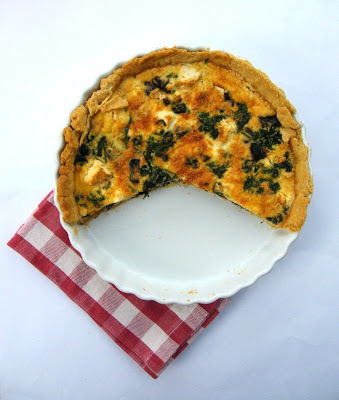 Love spinach in my quiche..yours look lovely! It is so beautiful and I can taste it just looking at it. 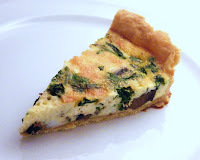 We love quiche and will have it soon. Thanks for the recipe. Now I am a BIG tart and quiche lover and this looks amazing, the ingredients are MY kind of ingredients Jac! LOVELY! Yummy. I love the combo of spinach, mushroom and feta.